This is a film which I was very surprised when I watched it. To see cuh an open relationship between two men was glad, 'cause I think there's still a lot of "tabu" with this. 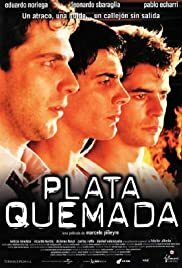 "Plata quemada" explores the romance between them ("los mellizos") and third people, and how beyond all the circumstances they know how they love each other without even telling each other.